The Corsair A70 High-Performance CPU Cooler uses advanced thermal engineering technology to deliver superior air cooling performance: four 8mm copper heatpipes directly contact your CPU, and the surface is planed to increase heat transfer efficiency. Dual speed-selectable 120mm fans, mounted on rubber studs, spin quietly in a push-pull configuration for optimum airflow. 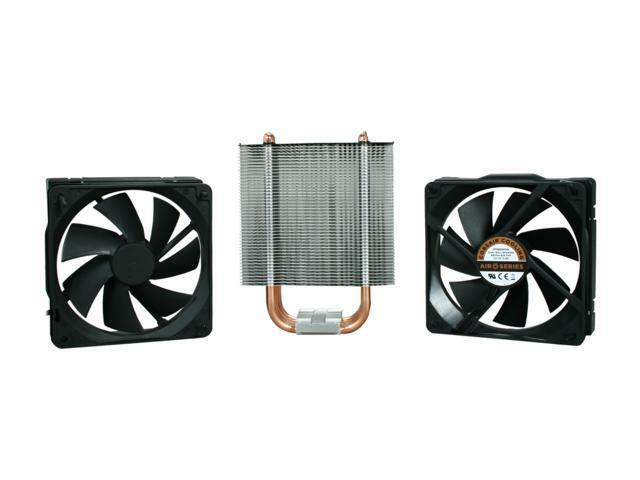 Superior Air-cooling Performance Four 8mm U-shaped copper direct-contact heatpipes go through the aluminum fins and meet at the base of the heatsink where they are in direct contact to the CPU, delivering optimal heat collection and dissipation ratio. Dual 120mm Fans with Selectable Speeds Dual easy-to-install, low-noise, low-vibration 120mm fans offer two speed options, allowing you to select the cooling performance you want. Universal Socket Compatibility The Corsair A70 includes mounting brackets for Intel LGA775/1366/1156 and AMD socket AM2/AM3 motherboards. Other Thoughts: I would recommend this if you don't need to worry about CPU heat-sink space, ^ if it's on sale without the rebate nonsense. Pros: Very economic, cools great, 2500k running at 4.5GHz. Cons: Can't reach the ~5.0GHz mark like the Noctua cooler, which is expected of such an economical cooler in this price range. Cons: instructions are pretty bad, they're mostly (bad) pictures and leave out a few steps. Sadly, this has been the case with the last 4 CPU cools I have bought, from several different companies. Have technical writers gone extinct, or something? You can't grip the thrumbscrews well enough to tighten the cooler on by hand, and they're partly under the cooler, making using a phillips driver nearly impossible. I had to break out the vice grips to tighten them on right. A tun that I could use an allen driver or wrench on would be much more appreciated. Other Thoughts: Note that I did not even turn on the stock fans on, I had purchased a pair of Scythe SY1225SL12LM-P fans specifically to use with this cooler. 300-1300 PWM fans, paired with a Fractal Design Define Mini case, the computer is totally silent - even with the fans at full speed. Also, while this cooler was packaged with some thermal compound, I used some AR5 that I had lying around. Comments: Corsair processed and mailed back the rebate quickly. I have done rebates before and gotten no response. Corsair doesnt rip you off like other manufacturers. Comments: Not for small cases, barely fit inside my Antec Lanboy. Cover went on with only 1/4" to spare between the mesh and the top of the heatsink. Comments: This is a very well built heat sink. I do not know how loud the stock fans are as I'm using a couple of Noctua NF-P12's. Really like the front Corsair plate. It definitely looks better than my old Hyper 212 Evo.